I have been travelling quite a bit for work lately. Fortunately, travelling frequently means uninterrupted knitting time - and so I have been able to get a few things well under way recently. This particular project is part of my oft-mentioned Doggerland collection. The design uses Faroese Snældan 1ply yarn - and I am happy to announce that the yarn will soon be available to purchase in the UK thanks to The Island Wool Company. My Doggerland collection even has a tentative release date too: look out for more announcements and a slew of blog posts towards the end of February. It has been a long time coming, but I can finally see the light at the end of the tunnel. So, I have been knitting my way up and down the country. London was on the itinerary earlier this month. I managed to combine seeing trends in summer knitwear with a trip to Loop London (very cute place - I escaped with buttons) and hanging out with good buddies. Still, London is no longer as magical as it seemed when I first visited aged 13. Then again, few things are as magical as they seem when you are young. And yesterday I was assigned the role of Official Photographer when a real textiles legend came to Edinburgh. Again. Travelling. Again. Knitting on my way there. Not a bad way to spend one's life. First I had brunch with a handful of Edinburgh knitters (thank you for the company). I also visited a new Edinburgh yarn shop run by the very lovely Kathy who is the sole UK stockist of lace yarn from St. Kilda (ooh). 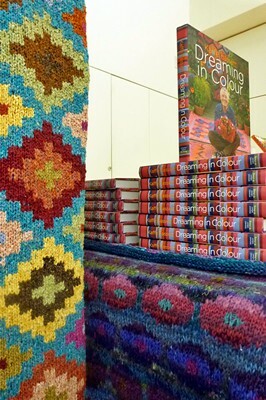 I really enjoyed meeting Kaffe Fassett. As you might imagine he had interesting things to say about colour, drawing upon tradition, and how to engage with textiles. I mentioned my mild obsession with knitters' hands and he responded by talking about he thinks about his own hands when he works and what handmade means compared to machine-made. I was also taken with the thoughtful way he spoke about conformity and the 20th century rejection of folkloric traditional art. Mostly I felt I was bathing in a sea of colour (which was impressive seeing it was a dark and dreary November night). 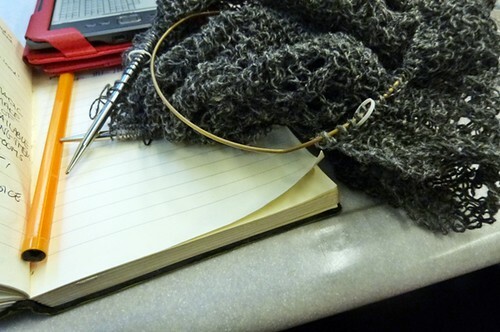 Then I travelled home whilst knitting. Yet again.